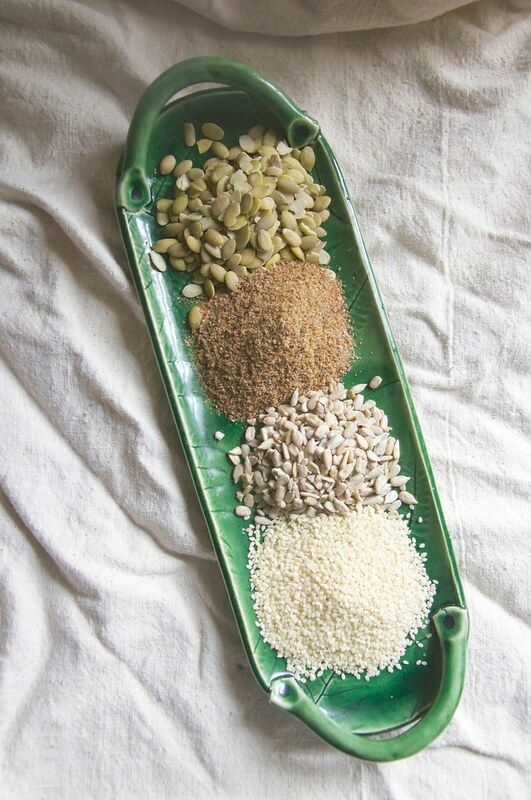 In my deep fertility-related internet searches, I came across the practice of seed cycling. Have you guys heard of this? I actually had before. A long while ago, as one of my friend’s moms swore by the practice. The idea is that the female body is ruled by different hormones at different phases in their cycles. Certain seeds can support these hormones, and -- as a result -- “seed cycling” is a practice often promoted by naturopaths. Before I write more, just note if you suspect you have a major hormone imbalance, it’s best to work with your doctor first. I’ve had mine tested and they’re all in “normal” limits, so I see seed cycling simply as a support of good function. There’s not a lot of scientific proof it even works, but I’ll get to that later. For those of you unfamiliar with your menstrual cycles (I’m way too familiar at this stage), there’s the Follicular Phase (before ovulation, average days 1 throughout 14) and the Luteal Phase (after ovulation, average days 15 through 28). My own cycle isn’t quite this predictable, but you get the gist. // The Follicular Phase is more estrogen dominant. In the first half of your cycle, your body fosters and prepares to release the egg. Disruption to the balance of estrogen can result in anovulation (skipped ovulation), late ovulation, or even painful ovulation. // The Luteal Phase features progesterone on center stage. This half of your cycle is all about preparing the uterine lining for implantation and supporting possible pregnancy. Too much progesterone can lead to intense PMS symptoms. Too little can inhibit pregnancy or lead to mid-cycle spotting (indication of many things, but often a premature breakdown of the lining). What do seeds have to do with it? Supposedly, you can balance estrogen and progesterone by eating certain foods. I write supposedly with some weight here; I have only just begun my own adventure trying this stuff out. But you’ll find plenty of happy women who are convinced the seeds worked major magic to lessen PMS symptoms and even boost their fertility. // Flax and pumpkin seeds contain a hefty dose of omega-3 fatty acids. Flax contains something called lignans, which can actually block excess estrogen. There’s actually a lot of zinc in the pumpkin seeds that helps with progesterone production, but the flax counteracts and balances. // Sunflower and sesame seeds give your body a mix of selenium and zinc. The work together to promote hormone balance between estrogen and progesterone in the second half of your cycle. 1 tablespoon ground flax seeds + 1 tablespoon ground pumpkin seeds per day. 1 tablespoon ground sunflower kernels + 1 tablespoon ground sesame seeds per day. Now, if your cycles are terribly irregular or even absent, you are supposed to start with the Follicular Phase seeds in conjunction with the new moon. I’ve read a few places that if this works for you (or at all), you can expect to see changes around the 3-month mark. Toss your seeds into smoothies, make tasty energy chunks with them, sprinkle them on toast with honey, or stir them into morning oatmeal. Whatever you do, consume them raw and ground for the best absorption. You should ideally avoid the seeds that don’t correspond with your hormone needs during the opposite part of each cycle. I don’t know, you guys. It sounds a bit nutty (seedy?) to me, too. At the same time, I do think food and what we consume can have an impact on our bodies -- menstrual cycles included. There’s such a link between the inside and out, the inner workings and our external environment. What we put into our bodies has power. 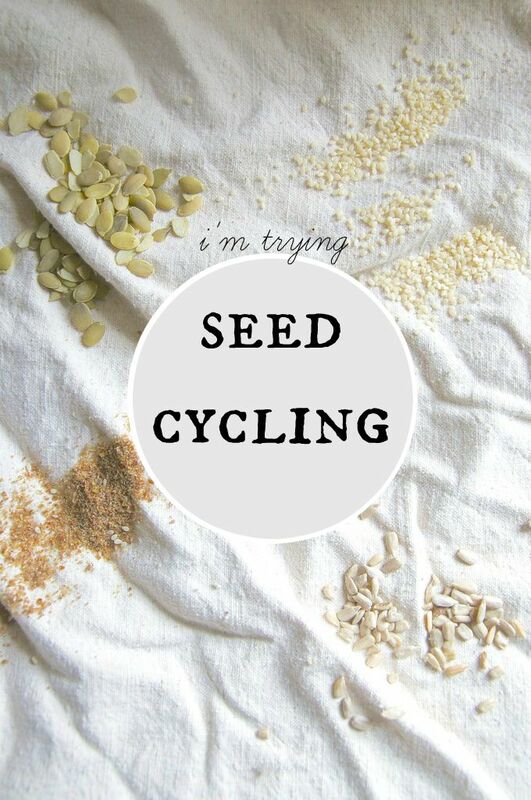 To me, this whole seed cycling thing falls in the category of couldn’t really hurt, why not try? And -- really -- so far the major impact seed cycling has had on me is helping to keep my diet healthy. It’s making me think more about the foods I’m consuming. So, I guess that’s helpful regardless. If you’re interested in reading more about this seed cycling practice, check out some of these sites. I’ve only given you the short and sweet version. I’d love to know if any of you have tried seed cycling before. Did you like it? Is it all hype? Leave a note in the comments. I’ll be sure to let you know what results -- if any -- I experience in my little experiment.